Fifty tigers were beaten to death in the areas adjacent to the Sundarbans in the last 18 years while over 332 people killed by the big cats during the same period as they entered localities in search of food. Locals alleged that lack of food in the forests are forcing tigers to venture into human habitats, often attacking domestic animals. The last incident of killing a tiger was reported in January this year in east Sundarban’s Gulishakhali village near Jiudhara station when a tiger was beaten to death. Officials at the Forest Department witnessed the incident as silent spectators. Prof AK Fazlul Haque of Forestry and Wood Technology department at Khulna University acknowledged that lack of food in the Sundarbans is forcing tigers to look for food elsewhere. He also cited poaching as another reason why the tigers get out of the forests and blamed the Forest department’s reluctance about it. Md Nur Alam Sheikh, coordinator of ‘Pashur River Water Keeper’, said the populations of deer, wild pigs and other animals, considered to be food for the tigers, are decreasing fast. 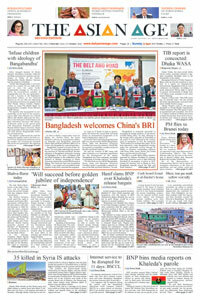 On July 22, Abdul Latif, a resident of Burburia village in Sundarbans union, had reported that two of his cows missing. One of them was later found eaten. As a result, the villagers joined hands in putting up night vigilance to prevent further attacks by tigers. 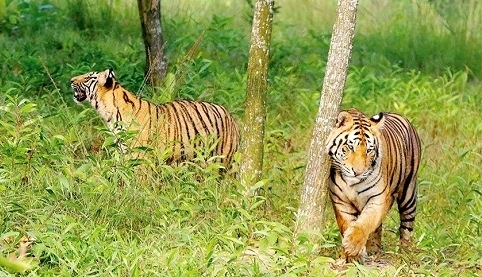 Assistant conservator of Khulna Forest department Amir Hossain Chowdhury said there may be four tigers per hundred square kilometres on average. The probable birth of any new tiger may force others to provide food for the new ones, which may result in their venturing into human habitats. He refuted the allegation of illegal poachers saying that they are on alert in ensuring conservation of tigers in the Sundarbans, the world’s largest mangrove forest. Divisional forest officer of east Sundarbans Mahmudul Hasan said a tiger survey with the help of camera-trapping was conducted from February 14 till May 12 this year. They may come up with the exact number of tigers present in the region only after a data analysis can. Alamgir, a village tiger response team leader, said they often return tigers when spotted them in villages.